Mr. Larry Leigh is a well-respected conservationist who has spent a great part of his life educating others about the importance of wildlife and the environment. 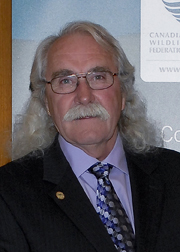 He has been a vital member of the CWF Executive since 2000. He held the position of President, a post he held until 2011. Before retiring, Larry worked with the government of the Yukon as an education coordinator for 17 years. Prior to this, he was a police officer with the Metropolitan Toronto Police Service for 15 years. Larry was born and raised in Toronto but has made the Yukon Territory his home for the past 32 years. He lives in Whitehorse with his wife Donna and two adult children Adam and Courtney. He continues to share his passion for wildlife with youth by teaching outdoor safety and survival, wildlife identification and outdoor ethics.